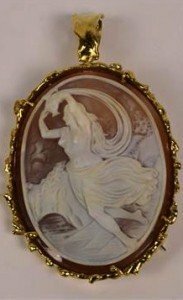 A well detailed late 19th century oval carved cameo brooch/pendant depicting a scantily clad classical maiden holding aloft a ewer, in yellow metal mount and with 18ct gold hallmarked hinged pendant loop attachment. 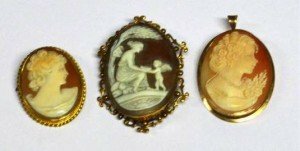 A 9ct rose gold mounted oval shell cameo brooch decorated with a scene of Cupid and Psyche in pierced mount with safety chain, a 9ct yellow gold mounted shell cameo brooch of a female bust with pendant suspension ring and a similar example with rope twisted rim. 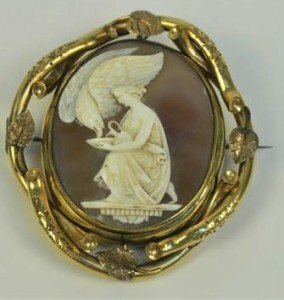 A large oval shell cameo brooch depicting Hebe and the Eagle of Jupiter, set in a yellow metal mount of twisted twigs and leaves, on a pivot with oval photograph aperture to the reverse with hanging suspension ring. 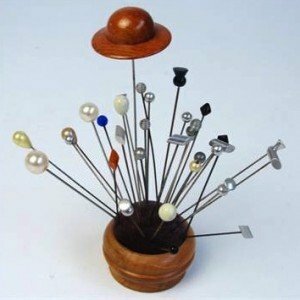 A large quantity of short hatpins in a wooden hat pin holder including pearl bead headed examples, plain metal headed examples, wooden, etc. 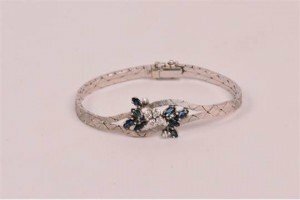 An 18ct white gold diamond and sapphire bracelet with textured strap and floral setting with six diamonds and eight sapphires. 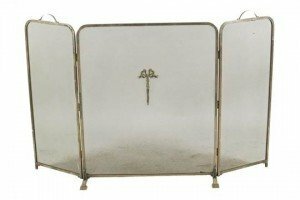 A white metal and mesh triptych fire-guard, with a pair of handles, the front decorated with a ribbon tied garland on sleigh feet. 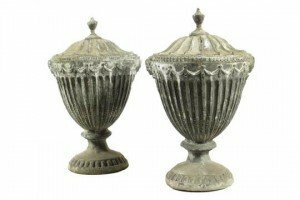 A pair of George III lead urns, each with an urn finial above a fan decorated top and a fluted body cast with swags and masks, on a beaded foot. 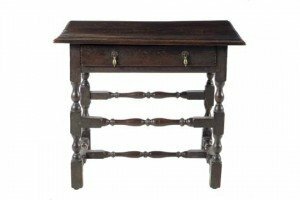 A Queen Anne joined oak side table, the boarded moulded edged top above a frieze drawer on block and baluster turned stretchered supports. A William and Mary walnut and oak side table, the boarded top above a frieze drawer on bobbin turned stretchered supports. 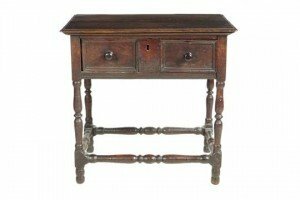 An early 18th century oak side table, the moulded edged boarded top above a panelled frieze drawer, on baluster turned legs, united by conforming stretchers. 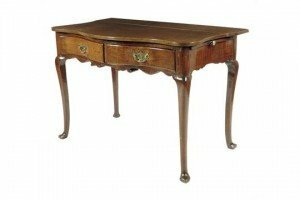 A mid 18th century oak serpentine side table, with two frieze drawers, the right side with a pull-out slide, on cabriole legs and pad feet. 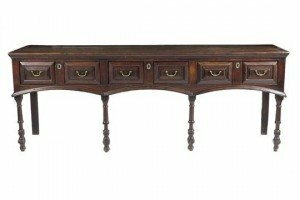 A William and Mary oak dresser, the triple boarded top with an applied moulded edge above three frieze drawers with fielded panelled fronts above an unusual curved moulding, on ring turned legs. 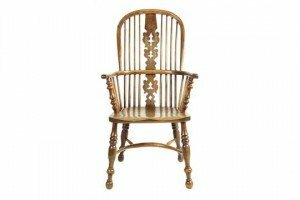 A Victorian yew high back Windsor armchair, the pierced burr splat above an elm set on turned legs united by a crinoline stretcher. 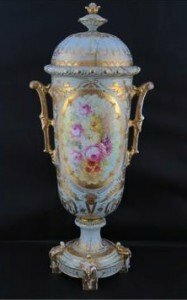 A Royal Bonn 19th century covered vase with handles, stand and domed lid. Two panels of flower painting surrounded by much gilding, all on a white ground. An antique Wedgwood teapot in dark blue Jasper ground with classical frieze. 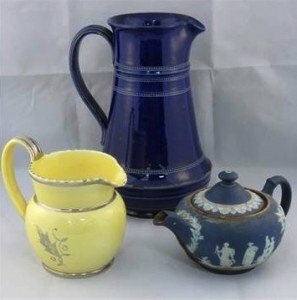 Also a Wedgwood milk jug in yellow with lustre decoration, and a Royal Doulton ewer in dark blue with impressed mark. 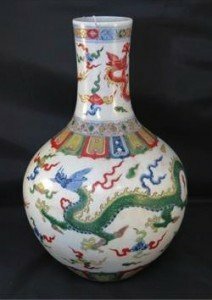 A fine Oriental bulbous vase decorated with dragons, bearing character back stamps to the base, all standing 28cm high. 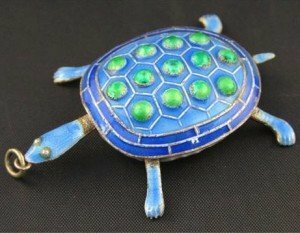 A polychrome enamel terrapin, articulated head, limbs and tail, blue and green on head limbs and tail, white enamel under shell, stamped silver on tail,. 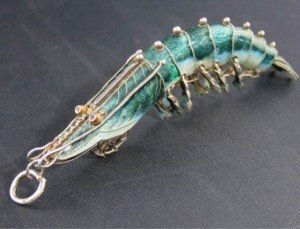 A polychrome enamelled prawn, articulated sections with mobile limbs. Opening mouth with silver stamped on lower jaw. 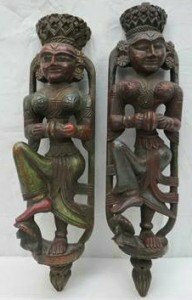 Two Asiatic carved wooden figures for wall mounting and representing female temple dancers with cymbals, traces of colour. 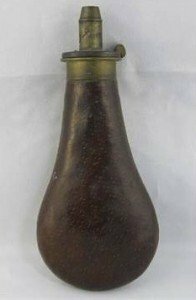 A fine quality early 19th century leather and brass powder flask having sprung loaded movement and adjustable nozzle.